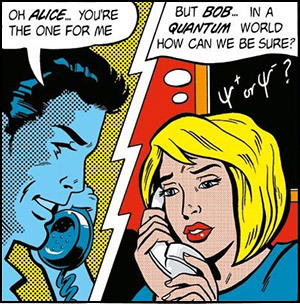 When the interaction between two hypothetical characters is needed to explain or describe some system, they are nearly always called Alice and Bob. Alice and Bob — A and B. This duo originally started out as a standardized way to explain cryptography. Over time, the duo has been adopted in explanations of mathematics, physics, quantum effects, and other arcane places, but has also been seen in fiction.note They are also found in a surprising number of trope definitions. We're trying to get them cleaned out. Feel free to pitch in. This may be a doomed effort since many invocations are potholed to this page. Where more than two characters are needed, other names are used, such as Carol and Charlie. Some names have acquired standard meanings, such as Eve the Eavesdropper. Lists of these can be found in Bruce Schneier's book Applied Cryptography, and at that other wiki. See also Those Two Guys, Greek Chorus. Movie and TV example: Bob & Carol & Ted & Alice. How to Lose a Guy in 10 Days has a romantic couple of Andy Anderson and Benjamin Berry. In most cryptography textbooks, communications are presented as being between Alice and Bob, and must be secured from a third-party interloper named Eve (for Eavesdropper, of course!). If the problem requires the involvement of more than two parties, then Charlie and Donna may be introduced. This is the basis for the XKCD reference. Other character names sometimes used for special purposes include Mallory (a malicious active adversary, capable of changing the messages sent between Alice and Bob, whereas Eve merely listens), Trent (a mutually trusted third party, whom Alice and Bob might prevail upon to execute protocols in which they don't trust each other), and Peggy and Victor (the prover and verifier, respectively, in zero-knowledge proofs). Game Theory books often use an adaptation of Alice and Bob in "Rose and Colin" (rows and columns on game theory charts), with "Larry", or "layer" thrown in for three person games. Game Semantics books tend to use Abelard and Eloise (for resemblance to the universal and existental quantifier symbols, which are an inverted A and a backwards E). They are also the names of a medieval logician and his lover. Alice and Bob are the names of the parents in Vernor Vinge's Rainbows End, and a government official is named Eve Mallory. E. R. Emmet's "Our Factory" puzzles feature "Alf", "Bert", "Charlie", and so on. In Tae Kim's Guide to Learning Japanese, a free, online textbook, Alice and Bob are the main characters used in example dialogues and mock conversations, posing as foreign exchange students in Japan. In Another Note, the first generation of would-be successors to L use the Code Names (or rather, letters) A and B.
TV and Movie example: Bob & Carol & Ted & Alice. One of the logos at the end of The Bonnie Hunt Show (2008-2010) is for "Bob & Alice Productions". Bonnie Hunt's parents are named Bob and Alice so it is either just a reference to her parents or both. Nerdcore Rap artist MC Plus+ has a song about cryptography named "Alice and Bob". Dilbert does this in a one-way fashion with "Ted The Generic Guy," who has no consistent personality and shows up whenever a generic extra is needed. Bad things tend to happen to him. His official bio notes that there may actually be multiple Teds, but nobody's sure. The Story of Alice and Bob is a humorous after-dinner speech recounting their mythology. A collection of Alice and Bob jokes. The Dwarf Fortress version is 'Urist McMadLibs, with the 'mad libs' part being descriptive, i.e. Urist McMiner, Urist McVampire, Urist McTantrumThrower, Urist McUselessNoble, and so on. Used in a very surreal Cyber Space level in World of Goo called "Alice and Bob and the Third Party," where you intercept information-goo transmitted from cosmicGrrrl! to LaconicCrusadr13. Used as examples for an explanation of quantum teleportation in Remember11. These are the default names of the main characters in Hack 'N' Slash. Eve also makes an appearance. 177: Eve tells her side of the story. 1323: Computer scientists will listen to any boring story if the participants are Alice and Bob & co.
Alice is introduced in the opening chapter of FreakAngels. In the epilogue, she's explaining the story to a military officer named Bob. In Rage Comics, Derp and Derpina are the equivalent. There's actually a blog named Alice and Bob. Catalog Living has the imaginary Elaine and Gary. They (or rather, a number of male-female duos named after them) are the main protagonists of The Troperia Saga. Alice and Bob really are quantum- a professor at the University of Washington has used two separate remote cameras, named Alice and Bob, to test the theory of non-locality and its potential for time travel, by attempting to receive a message before it's sent. The experiment hasn't yielded results so far, but it's telling. In linguistics, it's more often John and Mary. No, You Go First: Well, Alice and Carol, but Bob is Carol's boyfriend.